SEC Director of Enforcement Andrew Ceresney spoke with WSJ’s Francesco Guerrera at the CFO Network about the SEC’s recent enforcement strategy in regards to dark pools, high frequency trading and other new developments. With the 2008 financial crisis in the rearview mirror, the U.S. Securities and Exchange Commission is turning its attention to an ambitious agenda for enforcing financial regulation. Leading the way is Andrew Ceresney, the SEC’s head of enforcement. 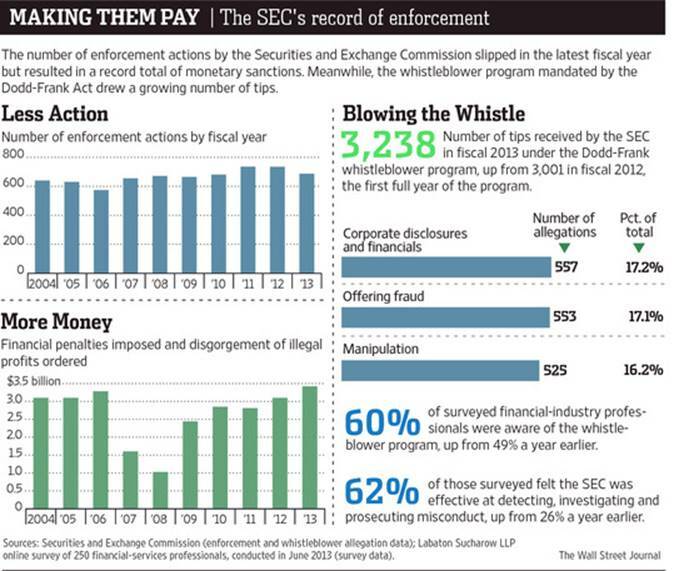 Mr. Ceresney sat down with Wall Street Journal financial editor Francesco Guerrera to discuss the SEC’s track record, its penalty authority and what the agency’s focus will be moving forward. MR. GUERRERA: Last year on this very stage your boss, Mary Jo White, said she wanted to start a new drive to get companies to admit guilt when they settle with the SEC, as opposed to letting them settle without admitting or denying it. Since then, you’ve had eight such cases. Why haven’t there been more? MR. CERESNEY: In a short period, eight is a really good number, particularly for a new policy. What we said at the time was that we were going to continue to do many of our cases on a no-admit, no-deny basis. That’s because admissions often are outweighed by other factors, such as quick recoveries for investors, conserving resources and avoiding litigation risk. We weigh all of that in deciding whether to seek admissions, so we’re careful about asking for it. I will say we have others coming down the pike, and over time we could see more. MR. GUERRERA: A big topic in enforcement has been the issue of market structure, the dark pools, the high-frequency trading. Is it more an issue of policy or of actual enforcement of alleged wrongdoing? MR. CERESNEY: There are lots of policy issues out there, and questions have been raised about whether the current market structure makes sense. I leave that to others to debate. My purview is enforcing the laws that exist now. That distinction is important because we aren’t going to bring enforcement action in cases where there’s a policy issue. It has to be a clear violation of law. And in that respect we have been very active and will continue to be. For example, we brought a whole host of cases over the past few years against exchanges at a time when before this there really had been no financial penalties against exchanges. We’ve had $25 million-plus in the last couple of years in six cases, which is a sea change in the way people look at this. MR. GUERRERA: If you were to name from an enforcement perspective the three priorities on the market-structure issue, what are they? MR. CERESNEY: Exchanges and enforcing the rules for exchanges. [Alternative trading systems] and making sure they are following the rules regarding the use of confidential information, among other things. And broker-dealers and making sure that they are following their particular rules. Market manipulation, order abuse and the like in the high-frequency trading realm is obviously critical, as well. MR. GUERRERA: Is it fair to say your enforcement agenda is now a lot more focused on things that have nothing to do with the financial crisis? MR. CERESNEY: We still have a couple of straggler investigations, but we are virtually past our work on the financial crisis. Now we are able to focus on other areas that demand attention, such as financial reporting, market structure, insider trading, investment-adviser fraud and other complex financial-instrument issues. MR. GUERRERA: What do you think when you see other regulatory agencies or other government agencies levying enormous fines on some of these companies? Do you feel that you’re not doing enough? MR. CERESNEY: You have seen over time our penalties also creep up, which is a function of a number of different things. However, some of the violations we punish are control violations, not intentional wrongdoing, so the scale is going be lower just because of the type of conduct at issue. It also reflects precedent, so that even if you are departing from precedent and you are well above where you’ve been in the past, you are starting from a lower level. There is legislation pending in Congress to increase our penalties, which would be helpful. BILL MAW: I’m the chief financial officer of Liquidnet. What do you think is the next smoking gun? I mean, high-frequency trading is out there…do you have concerns around any other areas? MR. CERESNEY: I think financial reporting and audit fraud is an area where we will be tremendously focused. The number of cases we’ve had over the past few years has gone down, maybe because our resources have been elsewhere. I think you will see a lot of activity there. I would say it is kind of the next frontier.